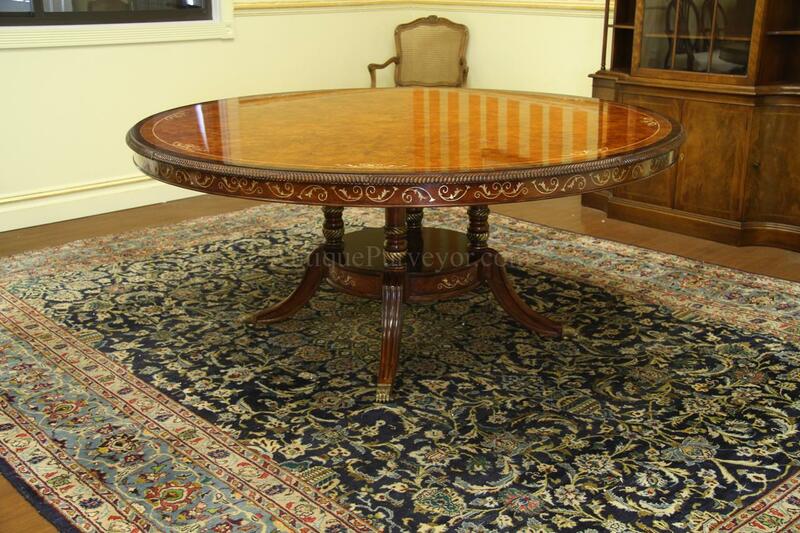 Luxurious 70 inch burly walnut round dining table on wide birdcage pedestal. 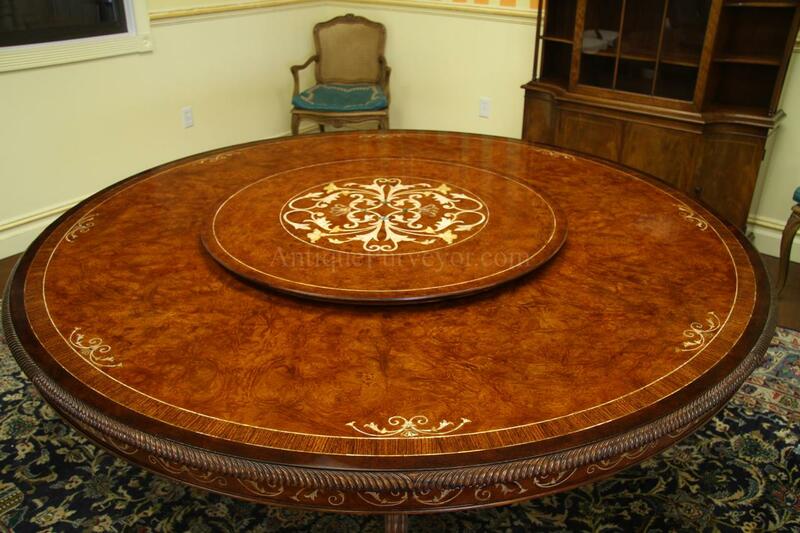 Optional lazy susan. 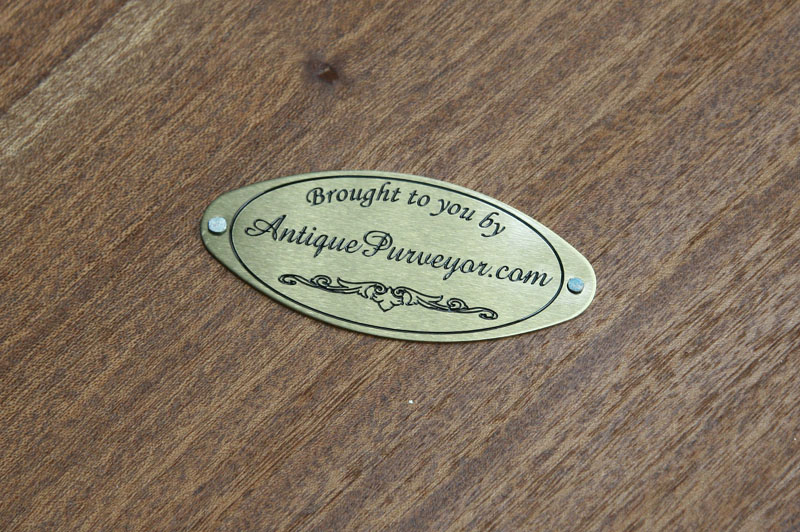 This hardware attaches pedestal to table top. 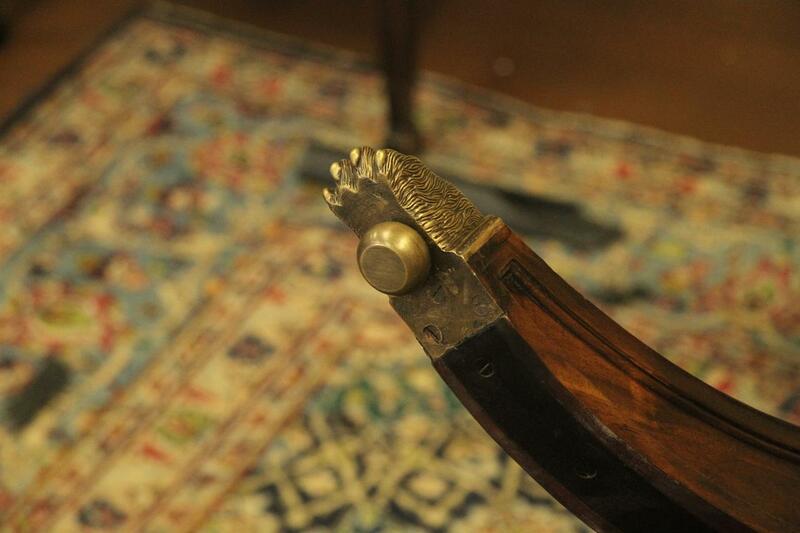 It is forged at the factory. 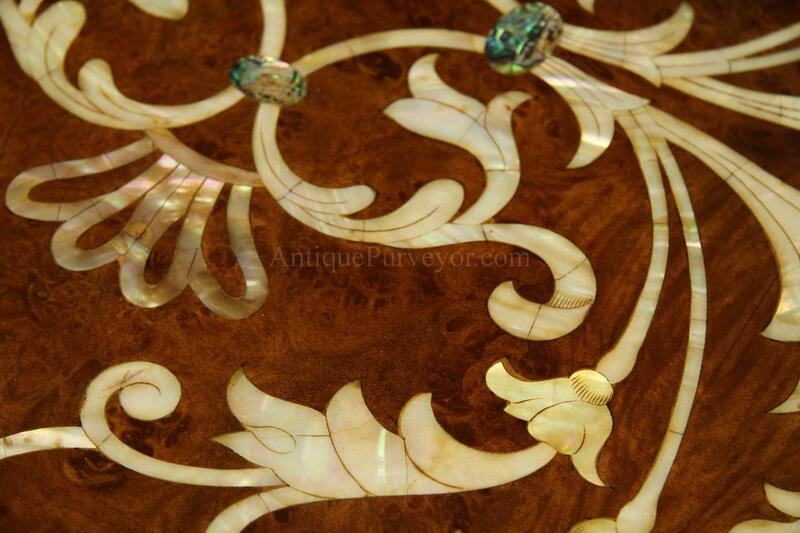 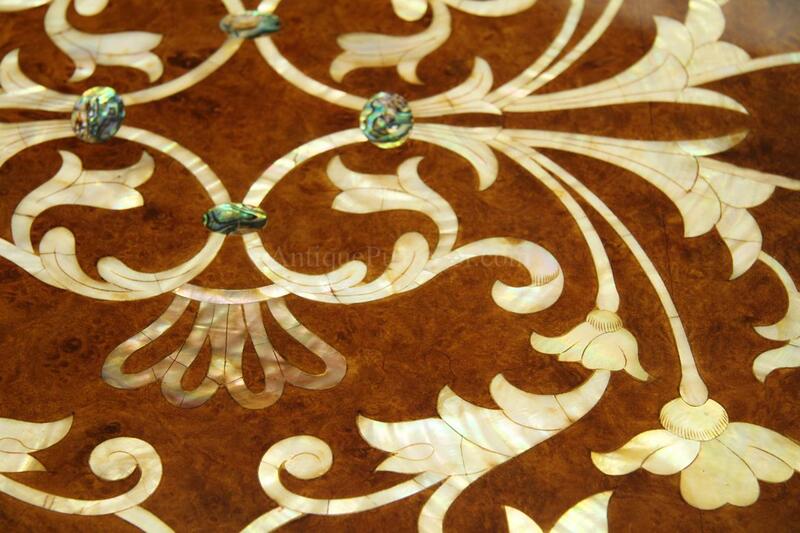 iridescent mother of pearl inlays on the lazy susan. 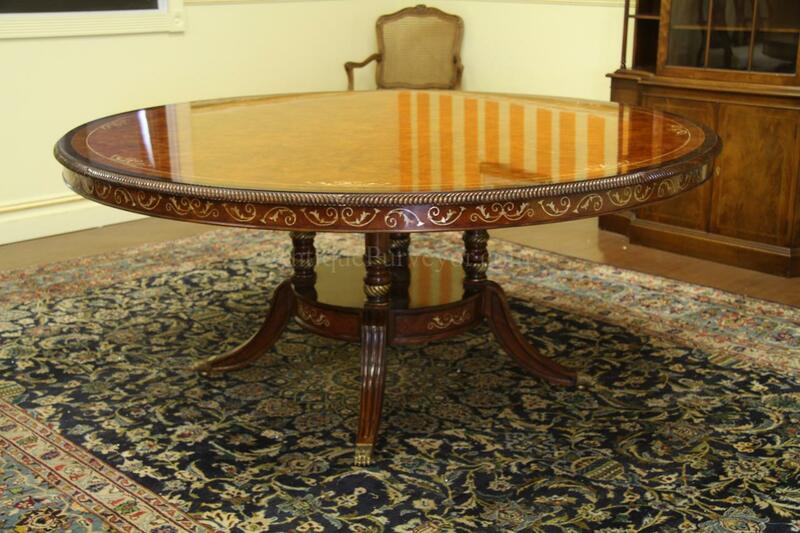 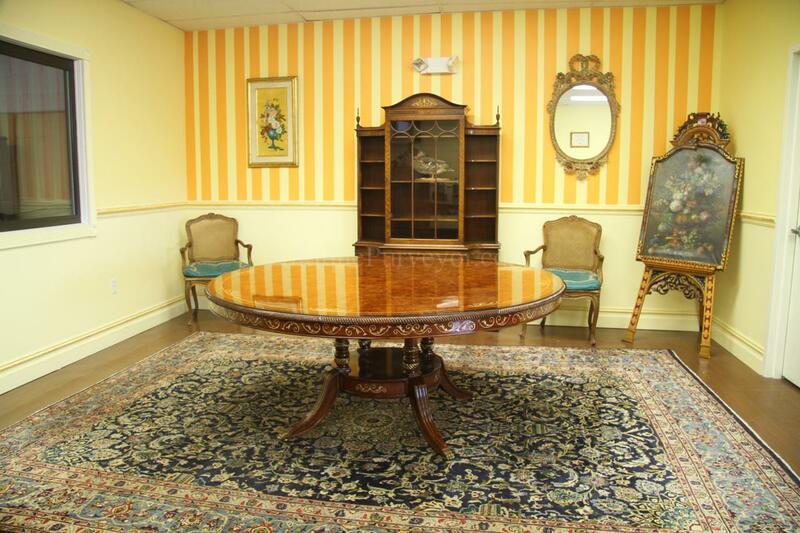 Luxurious 72 round table with mother of pearl inlay, rope turn edging and birdcage pedestal base. 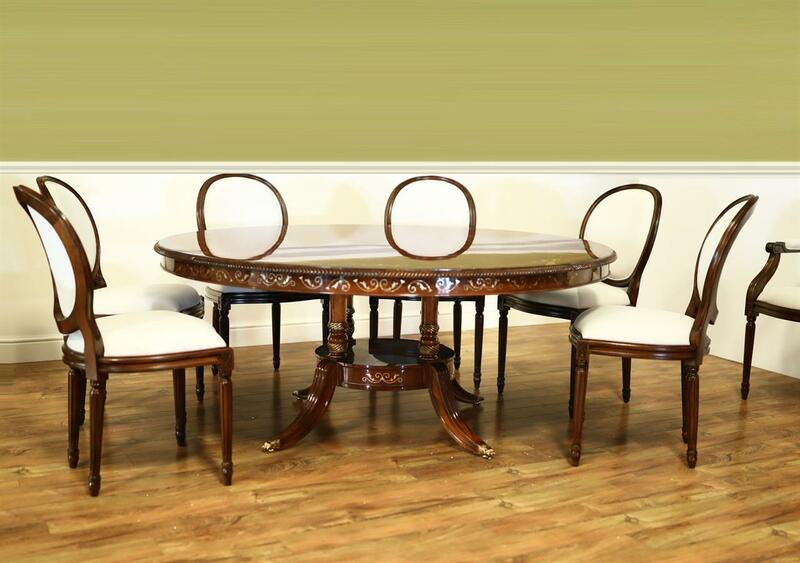 Description: Luxurious walnut 72 inch round dining table with Lazy Susan on traditional birdcage pedestal with outswept saber legs. 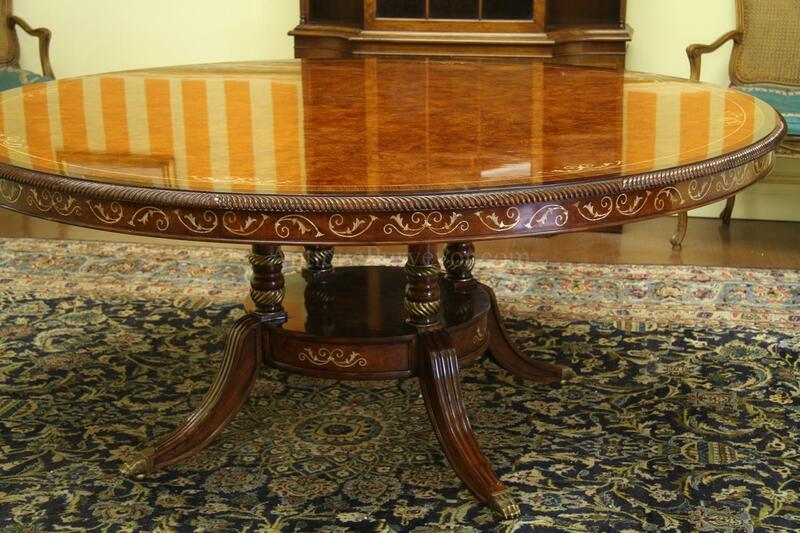 The table is actually 71 inches to be exact. This round walnut dining table is very heavy. 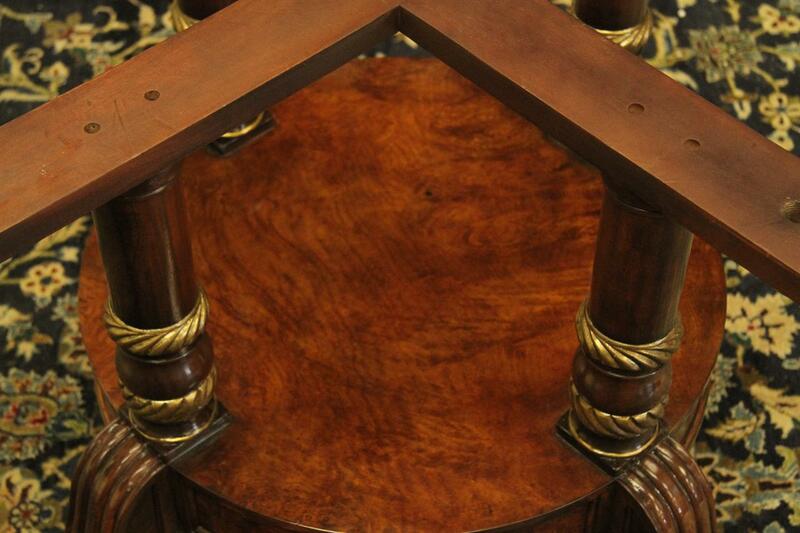 The apron on this table is not just a drop down apron as on most tables. 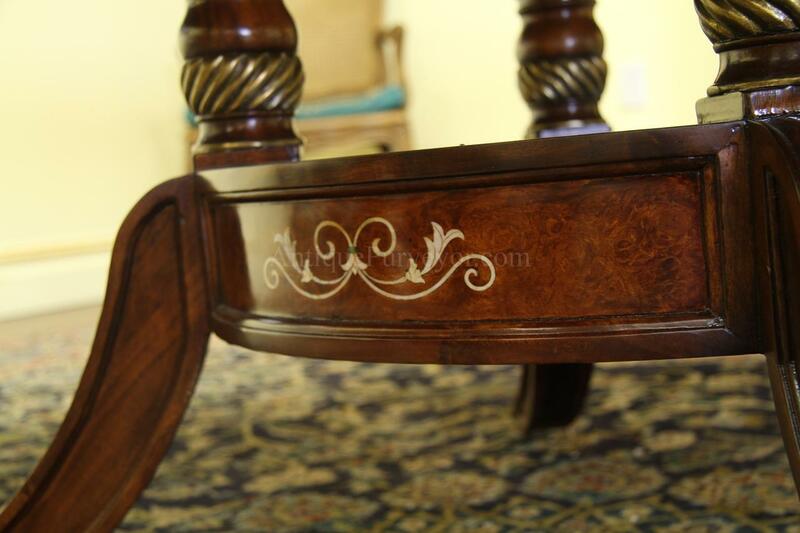 The bottom of the table is fully enclosed so the table looks and feels like it is 3 inches thick. 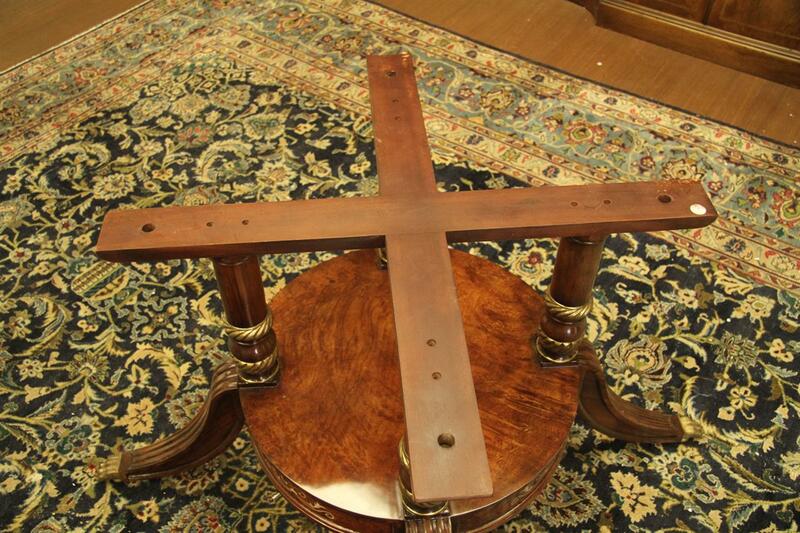 This makes it a very heavy and well built table. 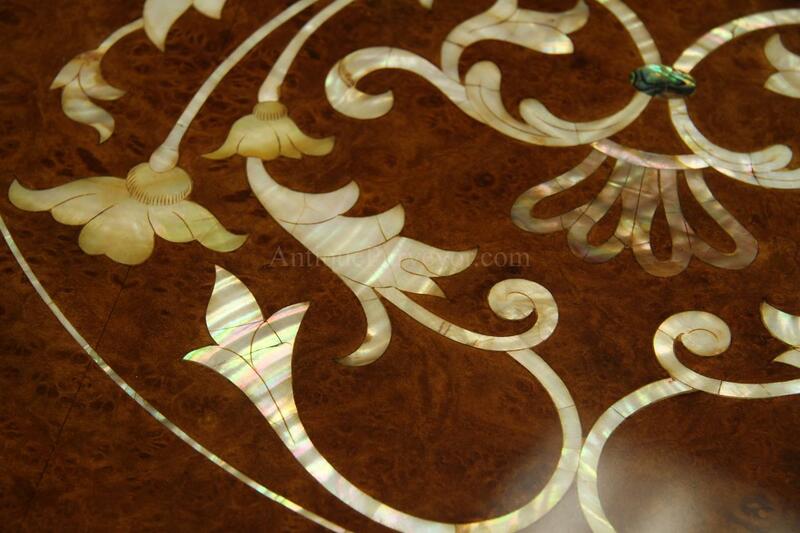 The inlays are crisp and colorful. 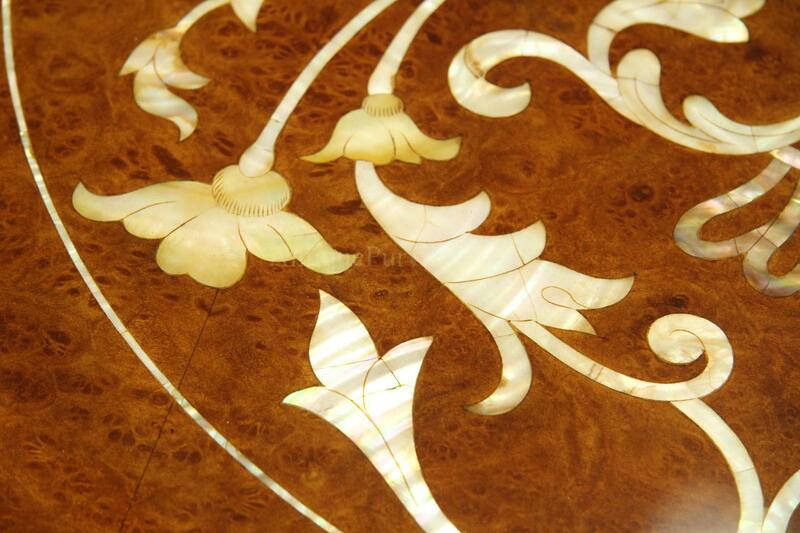 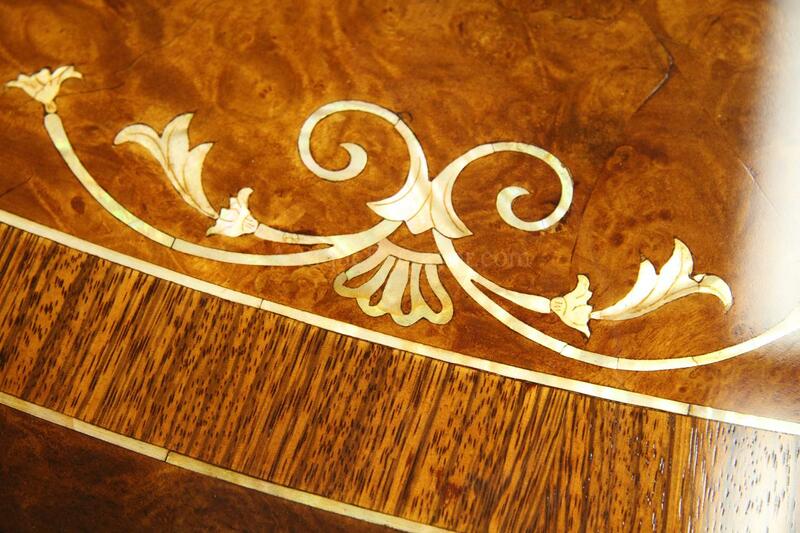 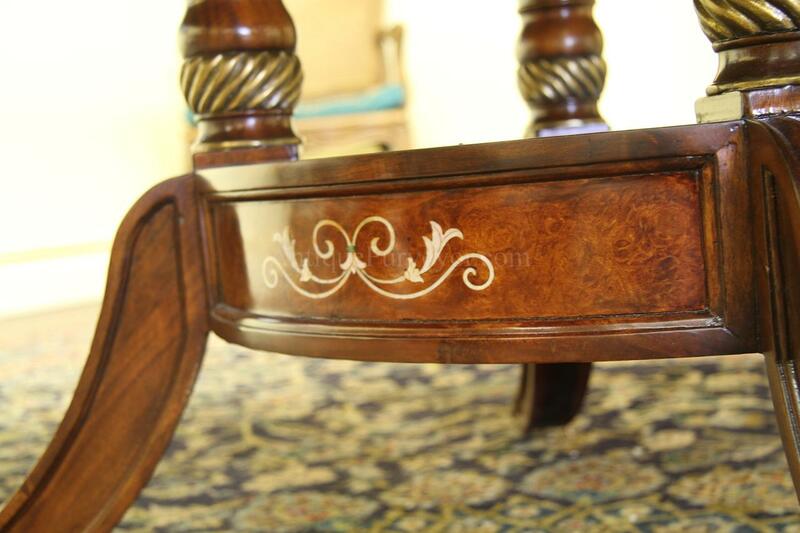 The top of the table is made with carefuly book matched burl walnut, the outside edge is rosewood banded and decorated with mother of pearl inlays. 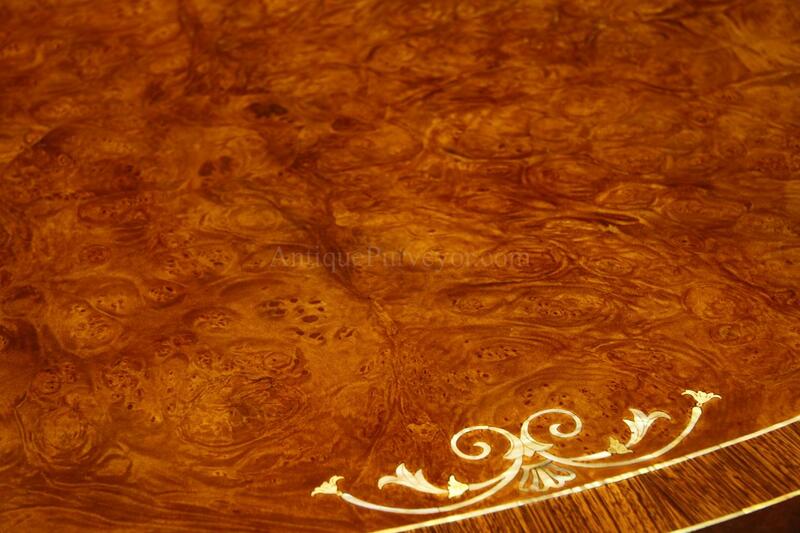 This table has a 80% sheen, but it is not a thick finish. 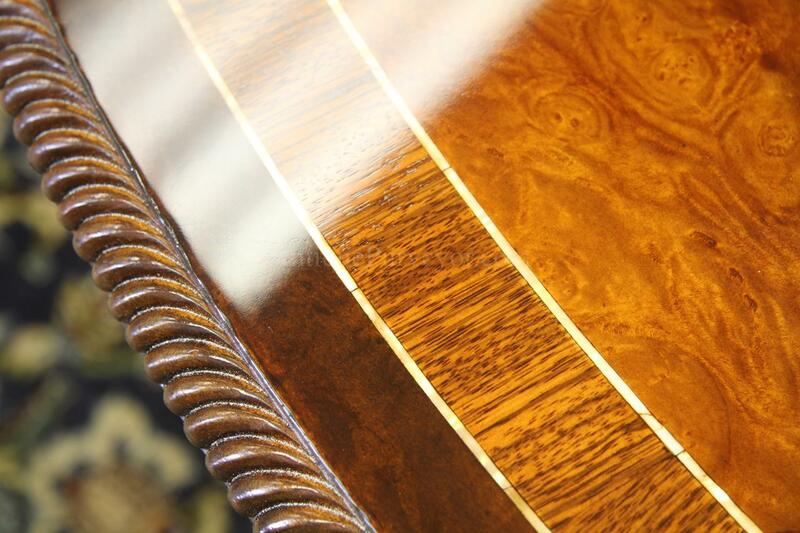 If you look carefuly into the wood grain along the edge of the table, you'll still see some open grain. 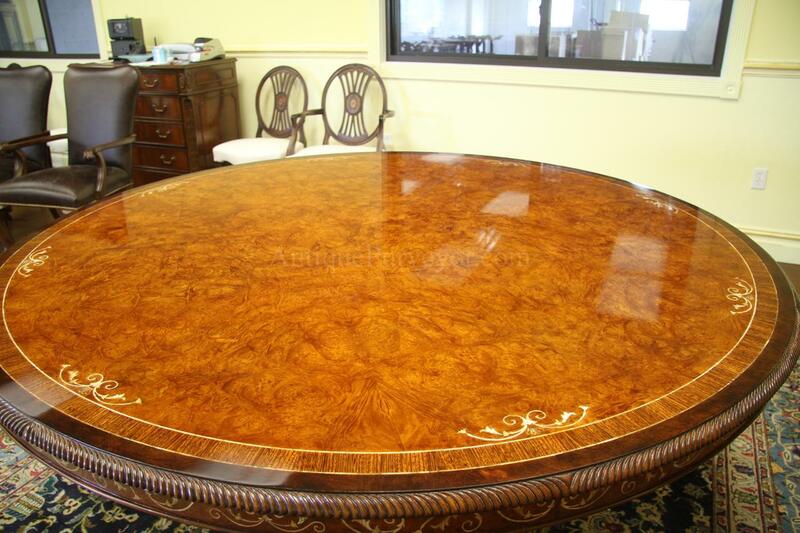 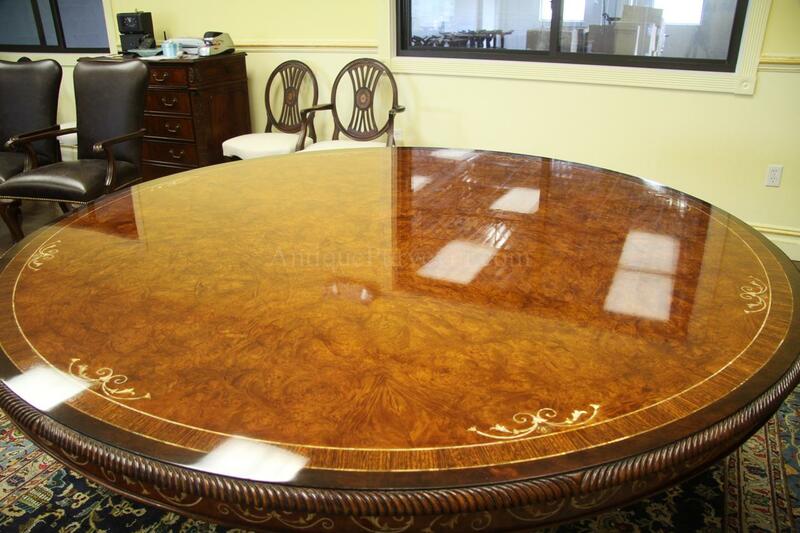 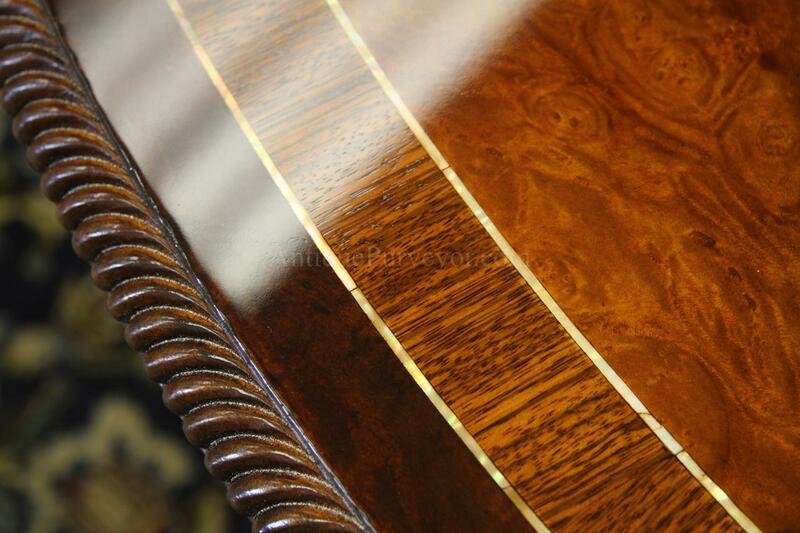 This walnut dining table for sale has a spectacular finish. 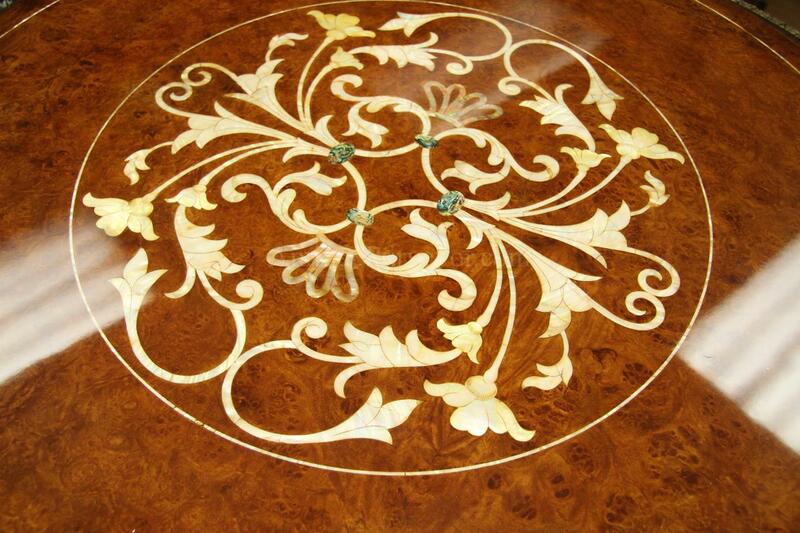 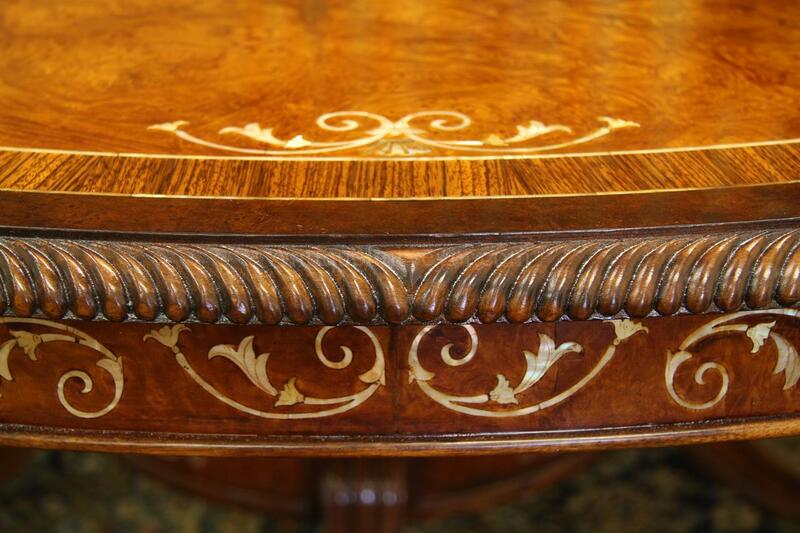 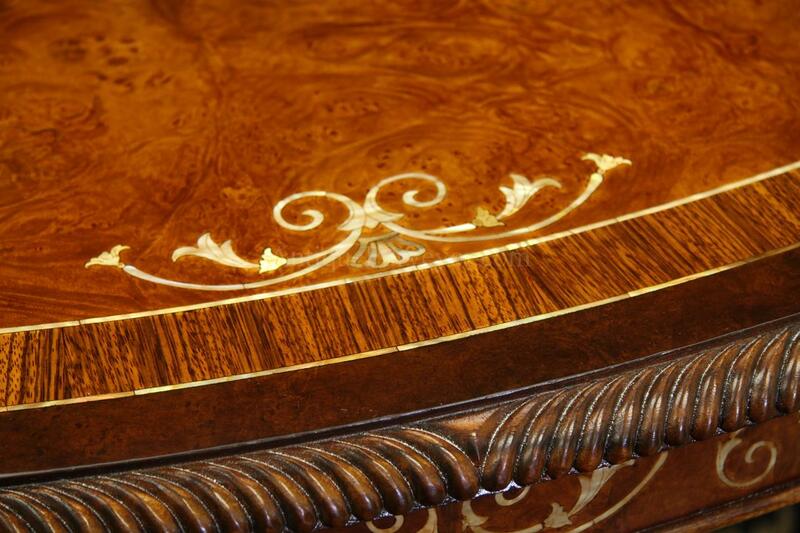 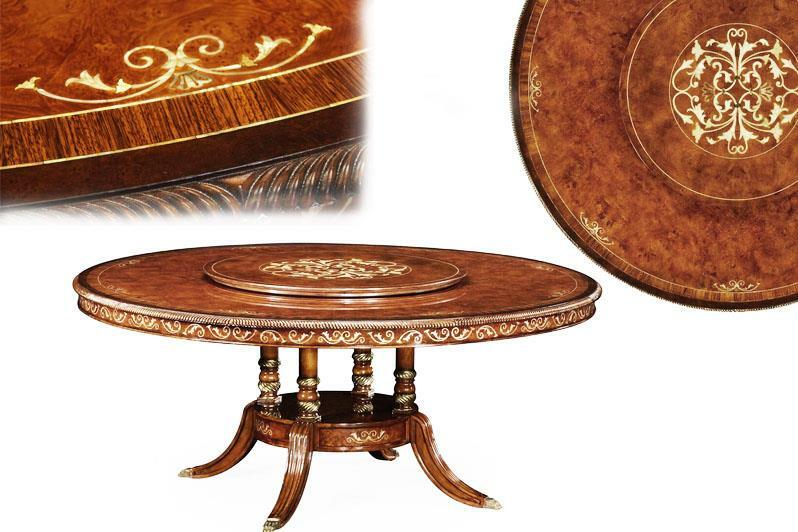 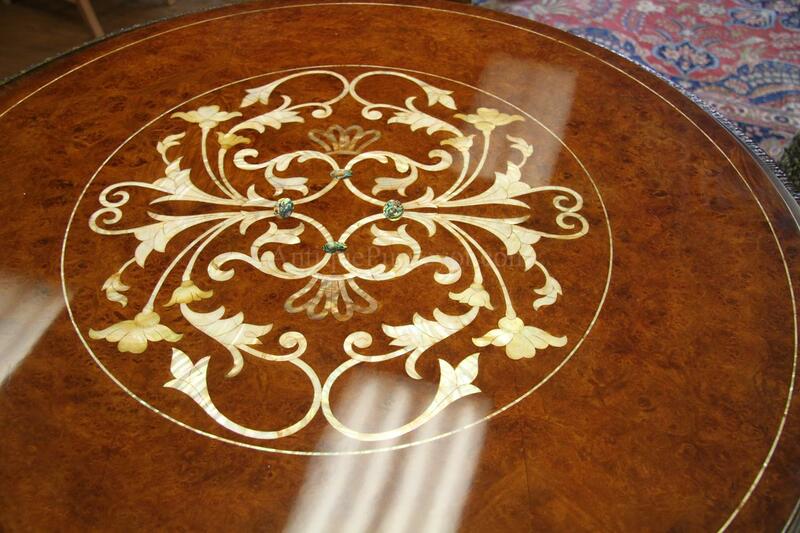 The lazy susan which is included is also inlaid with matching floral designs. 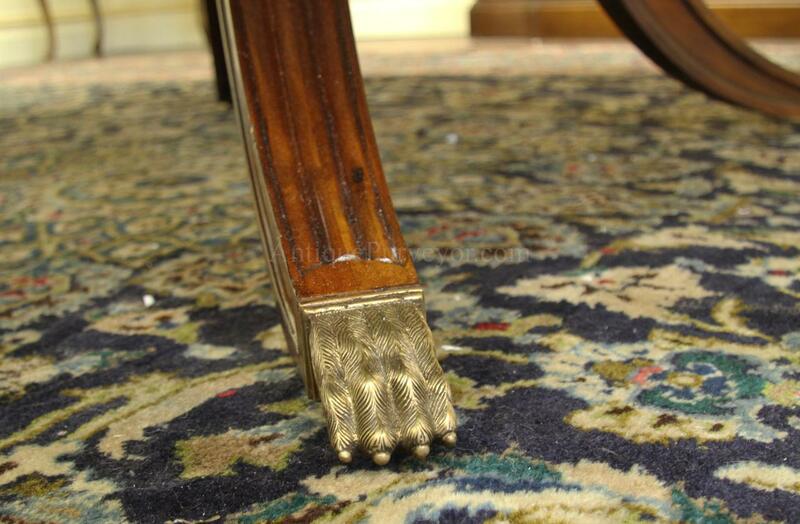 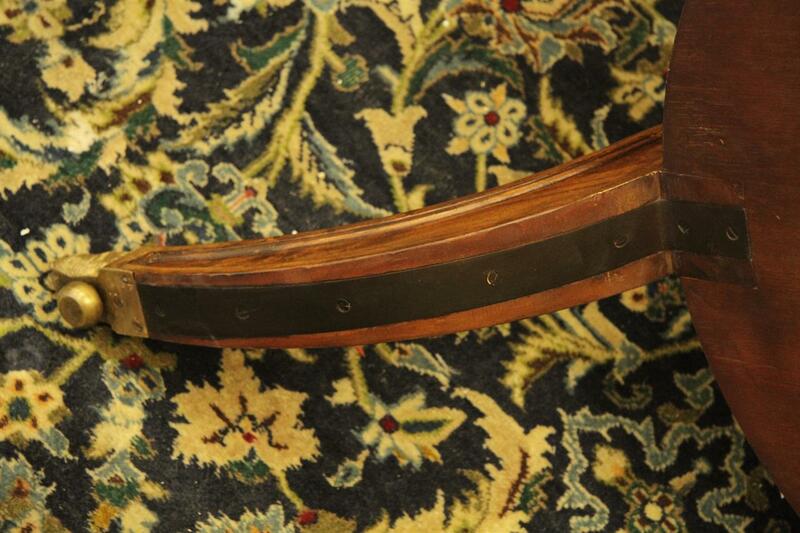 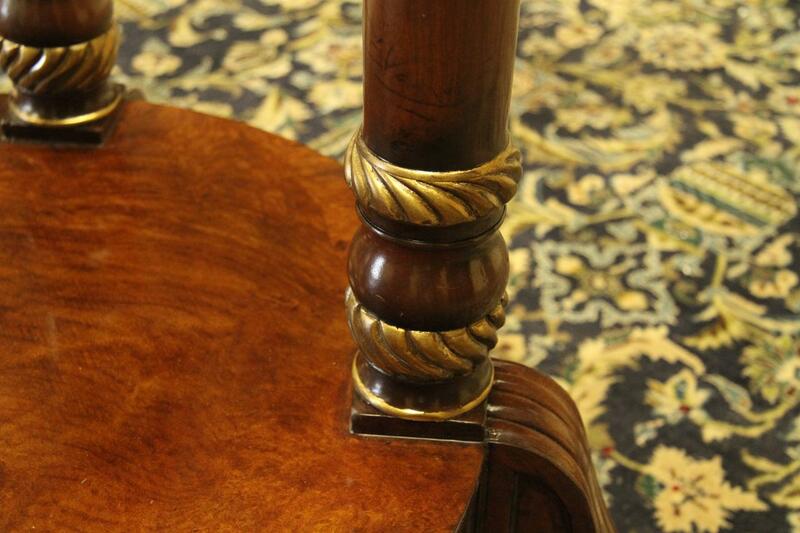 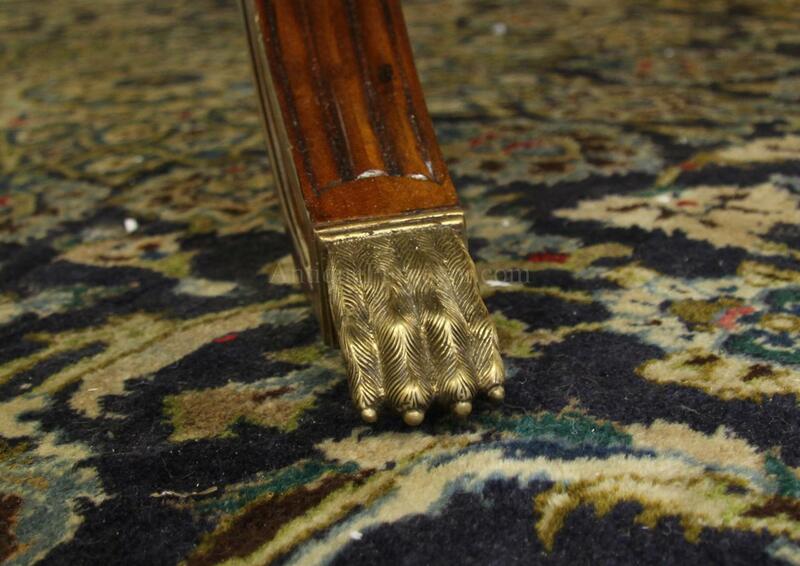 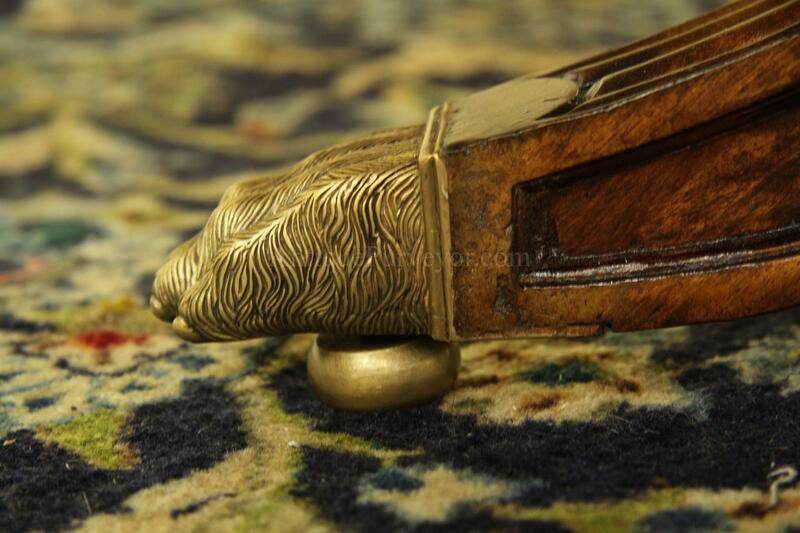 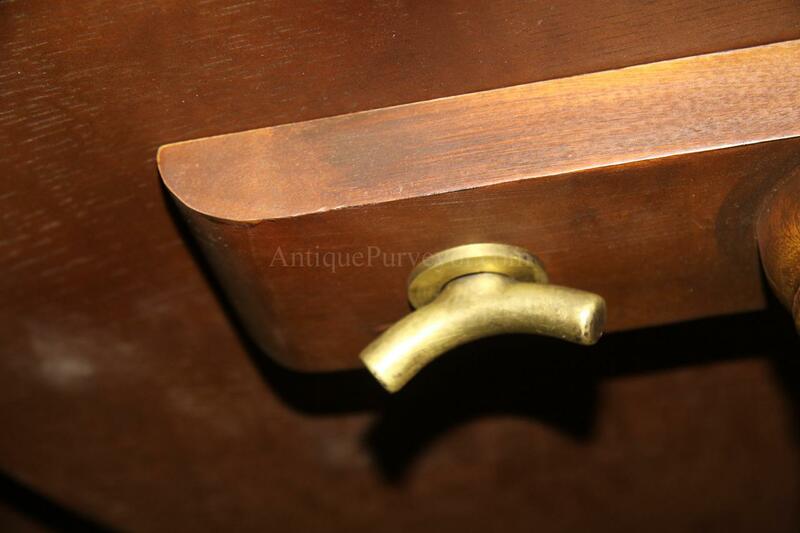 The hardware under the table, which attaches it to the pedestal, are factory forged and are made from solid brass. 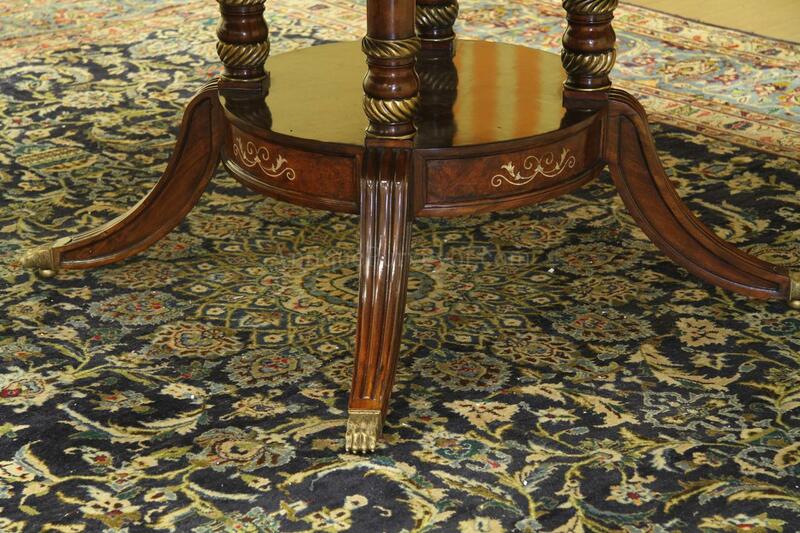 The feet are capped with brass feet and the adjustable brass casters are also forged in the factory for easy leveling on your floor.